Having a week one bye has allowed me some extra time to watch both high school and college football for the last few weeks. A play that I’ve seen numerous times is the inverted veer or “power read.” It’s a play that puts major stress on the defense as it is an option play that can attack inside or outside. For teams that have an athlete at quarterback and some speed from either a receiver or tailback, this is a play that with practice and repetition can put some explosiveness in an offense. In studying some game film of this play, the different scenarios of what can happen can be minimized. In setting up drills or practice reps, defenders can be controlled to give the offense a look at the possibilities that need to be taken into account. Film study also revealed some key coaching points to make this an effective play. During camp, our seniors make a short presentation to the team about any topic of their choice. The main idea is that they share something that will have a positive impact on the team. One of the most memorable for me over the last five years was by one of our defensive lineman. He hasn’t had the best of luck in his career. He’s had to battle back through a knee surgery at the beginning of last season and work hard to be able to play his senior year. He shared a concept he learned in his internship this past summer. The concept is “incrementalism.” Incrementalism is making changes by degrees or in small steps. Addison, our senior tackle, pointed out to the team that finding just a small way to improve each moment will add up to big improvement over time. I’m sure that approach helped him in his recovery. It’s hard to see progress some times in those situations because the recovery seems so slow. The same certainly applies on the field. We work to perfect our plays and techniques everyday, but perfection doesn’t come at once. It’s working those drills over and over focusing on getting the exact technique needed to be successful. The small improvements each day get us to where we want to be. This idea popped back into my thoughts this past Friday at a high school game while I was talking with someone who runs a scouting service. He said that most high school teams really don’t get good until about week four. I can see some truth in that statement. It does take time to really get good at those schemes and concepts that were installed in August. The daily repetition and attention to detail really start to separate the good teams from the average or bad teams. Incrementalism is the key to success. The teams that can stay focused and keep getting better at the little things within what they installed in camp will be the ones who compete for a championship. Those the get bored and try to find success through making big changes in scheme or constantly going back to the drawing board during the season are usually doomed to fail. Ultimately, getting players to understand this concept will help them both on the field and in life. Good luck this week. Keep moving forward! 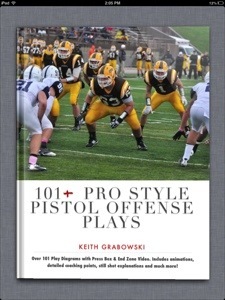 Please check out my iBook 101+ Pro Style Pistol Offense Plays available on the iPad now and soon available on the Mac as well.